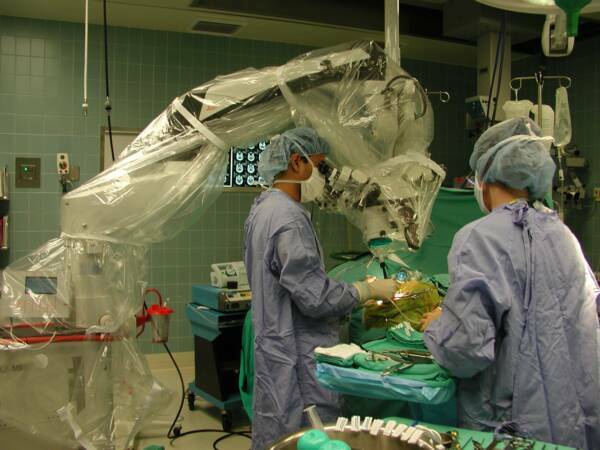 This is a picture taken during surgery at Mercy Medical Center, Springfield, MA. Dr. Kalia is looking through the operating microscope which illuminates and magnifies the surgical field. We use a dedicated neurosurgery team at our hospitals who are both well known to Dr. Kalia and outstanding at delivering the care needed in the operating room. This same set up applies for all cases from simple spinal surgery to the most complex brain and spine surgeries. Most surgeries are done under general anesthesia. Carpal Tunnel surgery and Glycerol Rhizotomies are done under local anesthesia with IV sedation. Patients briefly visit the hospital a few days before surgery for preadmission testing and are admitted to the hospital the morning of surgery. The person in the right of this picture is Ruthie F., the most dedicated, hardworking, skilled OR tech anyone could work with. I was honored and privileged to have worked with her.